Raintree International School provides a progressive early childhood programme for 1.5-5 year olds. In a safe and nurturing environment, we combine the British curriculum with a Reggio-inspired teaching philosophy. Above all, Raintree places a special emphasis on fostering creativity and communication, while developing each unique child within our community of lifelong learners. Our progressive early childhood programme is based on the British curriculum combined with the Reggio Emilia approach: through purposeful exploration and play, children are encouraged to inquire, think and collaborate to unfold learning and achieve academic success in their preschool years. Our language rich learning environments are facilitated by experienced teachers in a natural setting, enabling the children to learn languages in a meaningful and effective way. Within the diverse community at Raintree, children grow to become confident communicators and truly global citizens. Raintree pride itself on the caring and qualified teachers along with healthy child to staff ratio, ensuring that each child receives the care and attention he or she deserves. Our teachers work closely with parents to empower children to reach their full potential. 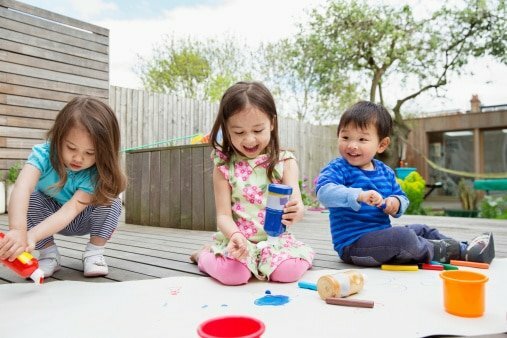 Set in over one rai of beautiful gardens in Bangkok’s central district of Sathon, our international preschool offers a unique balance of convenience and open green space to support a variety of outdoor activities and exploration of the natural world. Child-friendly facilities, purposefully designed in accordance with international preschool best practice, provide a safe learning environment that stimulates engagement and inspires learning.